Odds are, your computer is a primary source of entertainment. So why rely on standard computer speakers with so much rich content at your fingertips? 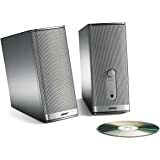 Step up to Companion 2 Series II speakers and unleash your computers true potential with powerful, full-range sound for CDs, DVDs, MP3s, streaming videos, games and more. Companion 2 Series II speakers deliver both the subtleties in your music and the rousing resonance of movie and game sound effects. Think of them as giving new voice to your computer. And with Bose TrueSpace stereo signal processing circuitry, that voice really has some reach. Experience a spacious, dramatic soundstage that seems to extend beyond the desktop speakers, whether you've set them next to your monitor or placed them farther apart. You'll also appreciate the clear, robust response for those challenging low musical notes and sound effects. Companion 2 speakers bring more than new flair to your desktop. They're also designed for convenience, with both the volume control and headphone jack close at hand. All so controlling your listening experience is as simple as you'd like it to be. Dual inputs enable the speakers to be used with your computer as well as a second audio source, such as a portable MP3 or CD player. And Companion 2 Series II speakers are magnetically shielded to prevent interference with your monitor. Now, its time to play. Quite simply the best computer speakers I have ever owned. Definitely live up to the Bose name and for $100 are an amazing value. Great speakers but they make a hissing, screeching sound every half hour or so.. I really wanted these to work! I have tested many different desktop computer speakers. In my opinion the best is the JBL Duet system, which retails for around half the price of these speakers. These speakers are good but they really aren't great. Pros: They look great, have good bass, and if you are on the other end of a room they fill the room up well. Cons: Treble not great. It's not as bad as some computer speakers but not as good as many other either. As I said they fill a room up well but if you are right in front of them they sound off kilter unless you position yourself exactly in the middle of them. Last but certainly not least, my biggest issue with these speakers: too much bass. They sound like they have a third subwoofer stuffed in there somewhere. Now, for some people this may be a selling point. For me, however, I bought a set of two small tabletop speakers because I didn't want the boom of the subwoofer. I want a little bit of bass but not a subwoofer's worth. These pack a subwoofer's worth, and you have to use a manual software EQ from your computer to adjust it lower; there is no bass or treble adjustment on the speakers themselves. Again, this is probably great for a lot of people but I don't like booming bass when I'm listening to Neil Young or the Beatles. Had a listen to them in a local electronic store. I bought these two years ago as a father's day gift for my dad. He likes to listen to music on his computer and only had cheapy speakers that came with the computer. I figured these speakers would be a good gift since Bose is well known for their superior sound and quality. Well, a few weeks ago I noticed that my father had switched back to his old cheapy speakers. When I asked him why, he said that the bass was better on the old speakers. Figuring that I didn't want $100 speakers to go to waste, I decided to use them on my own computer. Turns out, although these speakers are good, they're certainly not great. Let's talk about the positives first. I must first point out that there's a headphone jack right on the front of the speakers which is great. I also love not having to turn on the speakers when I turn on the computer. The speakers turn on when your computer turns on. Setup is also a breeze. Volume-wise, these can get really loud. Music sounds great and clear. The different levels of sound are distinct and clear cut. I've even used these to watch movies on my computer. You could almost compare the sound to surround sound on your TV. And now for the negatives. First, I wish there were settings for more bass since I'm a lover of bass. Second, if I'm comparing these to other speakers, the difference in sound isn't that incredible or noticeable. For a brand that prides itself on being far superior than other brands, Bose didn't really "wow" me with their quality. They're great, don't get me wrong. I just wouldn't dish out another $100 if something happened to my current set. its so sad that people are still raving about their sound, have any of you listened to other equipment? maybe the name bose just makes it ok to make and sell junk from the 90s and 80s, other speaker manufactures have made leaps in bounds in music and movie sound reproduction in the past 20 years, bose is the same old bose, they sell the same mediocre stuff(at least its become cheaper) but they still cant get this stuff too work all the time, what are they doing if not upgrading the sound to where every other company? Wow, I had heard Bose speakers were supposed to be cutting edge, and absolutely incredible. Maybe their other speakers are, but these computer speakers are shockingly bad. It's not that they are THAT bad, but the fact that they are soooo expensive and not worth even half of the price, is the part that amazes me. The first ten seconds I plugged them in and turned them on, I knew I was in trouble: The most immediate thing you'll notice is the shockingly poor balance between the treble/bass frequencies. Any voices you are listening to (song lyrics, video game dialogue, etc) sound muffled and muddy. If you are listening to music, the bass completely overpowers the higher frequencies and destroys the balance. And to top it ALL off, there is no treble or bass knob so you can adjust them. REALLY poor design choice, if you ask me.